We noted yesterday the Treasury’s weak auction, but this chart from Waverly Advisors puts yesterday’s sell-off in the 10-year into perspective. 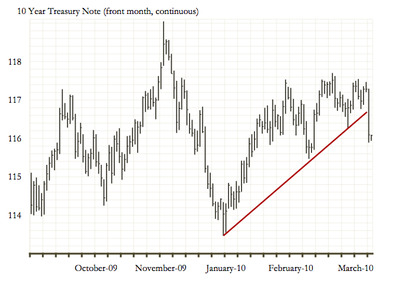 There is heightened investor uncertainty about the inversion of the 10 year swap spread. Unchartered territory puts investors on edge. In the near term, it has been attributed to hedgers using treasuries for all of the corporate issuances coming to market. We have also noted the strong demand for corporate paper has helped to push those yields down. Longer term, Pimco’s “Unicredit Bond Market” will likely be with us for some time. The good thing is this is not a total surprise, at least it wasn’t to Gross. We interpret these events as one of an increased belief in the recovery. For over a year, we have argued that Large Cap Corporate America was the healthiest and most liquid area of the economy, superior to the Government or Consumers. As belief in the recovery increases, the flight to quality bid in Treasuries slowly diminishes and Pimco’s “Unicredit” world emerges. Investors have every reason to have more confidence in a Warren Buffett or a Steve Ballmer. All of this being said, in order for the bond bear market to emerge and the rise in rates to be sustainable, the economic data needs to be there, or that flight to quality bid will re-emerge.